If you’re apprehensive about starting Invisalign treatment because you don’t know enough about the process, you are not alone. Many of our patients want to know as much as possible before beginning their Invisalign journey. To keep you informed, consider reading the most common questions we get at Williamsburg Dental. Your eligibility for Invisalign is not so much dependent on your age. What’s most important is your current oral and overall health. For example, it’s essential that you have healthy gums for the most effective Invisalign treatment. Teeth will not shift properly if your gums cannot sustain new positions for your teeth. With that being said, we do not recommend Invisalign for particularly young patients whose teeth are still developing. Millions of people have used Invisalign’s clear aligners to shift teeth, many of them being teenagers. They’re also the oldest clear aligners system to date, with two decades of operation and innovation to back up their use. Their SmartTrack material is designed to move teeth more predictably and more quickly than any other clear aligner on the market. After initially beginning treatment and switching from one pair of aligners to the next, patients do experience minor pressure and discomfort after the first few days of wear. However, this is normal and a sign that the aligners are working. If you do experience pain, schedule an appointment with us right away! Invisalign appointments are typically scheduled every four to six weeks. These visits are intended to measure your progress and confirm that your teeth are shifting as planned. If at any time your teeth aren’t shifting correctly, the dentist will make adjustments as needed. Caring for your aligners is as simple as your current oral care routine. Before you brush and floss, remove your aligners and allow them to soak in Invisalign’s cleaning crystals or a similar cleansing solution. Avoid using hot water as this can permanently warp their shape. After soaking, use a dedicated toothbrush to remove any loose food debris before rinsing. After you complete your treatment, you’ll need to wear a retainer to allow your teeth to permanently set in place. Once you’ve worn the retainer long enough, you can start wearing it exclusively at night from now on. Have more questions on Invisalign treatment? 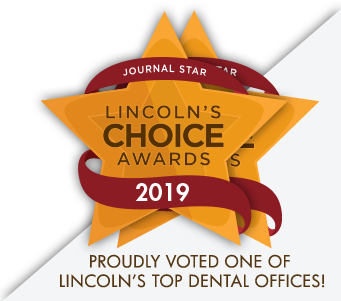 A dentist in Lincoln is more than happy to meet with you one-on-one to get your questions answered. Schedule a consultation today to get started!